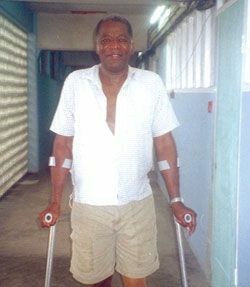 A 67-year-old amputee of Choppins Village is wondering if there is any justice in St.Vincent and the Grenadines for him. Harry lamented to SEARCHLIGHT that for the past 27 years he has been ripped off by lawyers, insurance companies and ordinary civilians. âI am tired of it. I just want the nation to know of the injustices that I face,â said Harry on Monday, January 7, 2008.
âFor years, there are things that worried me for which I have been seeking answers and getting none,â said Harry. In 2000, Harry disclosed that his car was parked when a man reversed a truck into it and damaged it. He said the owner refused to pay, and it cost him $3,500 to have a lawyer plea his case, and another $5,300 to repair his car. The frustrated Harry said to date he has not received redress. âI have since lost my leg and that doesnât impress the lawyer. I sent my wife to his office and all he is saying is he canât tell when anything will happen,â said Harry. Harry indicated that while he was waiting for this case to be tried, he went ahead and joined a friend in purchasing a minibus that cost $60,000. That friend has since died. âOne day I had a driver take the van to Georgetown. The van broke down and the driver took it to a man in Georgetown who claimed that the van needed a crankshaft,â explained Harry. He outlined that he had to travel all the way to St.Lucia to purchase one which cost $1, 439 plus $300 duty and plane fare. âI took the crankshaft up to Georgetown, but the man never fit it in. Instead he started cursing, and telling me I canât come and tell him what to do,â said Harry, adding that the man told him he would not get the van unless he paid him $750. âAgain, I put the case to the same lawyer. He made me get someone to check out the van and value it. All this was done and the lawyer never even wrote the man who had my van, and this is over three years,â Harry disclosed, stating that the man has now scrapped his van. Harry said his woes with lawyers started as early as 1980 when he bought a passenger van at a cost of $35,000. He said the van got into an accident, but even though the insurance policy stated that anyone could have driven the van with his permission, the insurance company refused to pay. Harry claims that he took the insurance company to court, but after visiting his lawyerâs office on numerous occasions, he opted to get a second opinion from another lawyer who upon investigation discovered that the previous lawyer had come to a settlement with the insurance company and there was nothing that could have been done. As a consequence, Harry said he ended up selling his house to pay the bank the mortgage on the van. âI feel bitter. I feel bitter about it. I am just thanking God for keeping me because somebody else would have committed themselves,â Harry stated. Harry said he is hoping that a lawyer can hear his plight and pursue the matter, if itâs not too late.